On the first day of Christmas, Always Fresh gave to me… A partridge in a pear tree! We’re celebrating all our gardening enthusiasts with the chance to WIN 1 of 3 $50 Bunnings Warehouse vouchers! 2. 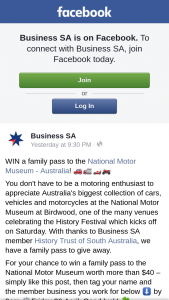 Entry is only open to Australian residents who are aged 13 years and older, and who are registered as ‘liking’ the official Always Fresh Facebook fan page during the time of the promotion or earlier. Employees and the immediate families of the Promoter and its agencies associated with this promotion are ineligible to enter. Immediate family means any of the following: spouse, ex-spouse, de-facto spouse, child or step-child (whether natural or by adoption), parent, step-parent, grandparent, step-grandparent, uncle, aunt, niece, nephew, brother, sister, step-brother, step-sister or 1st cousin. If you are under 18 years old as at the start date of the competition, you are required to obtain your legal guardian’s permission to enter and by entering you consent that you have done so. 3. The Promoter reserves the right to verify the validity of entries and to disqualify any entrant who tampers with the entry process or who submits an entry that is not in accordance with these Terms & Conditions of Entry. If there is a dispute as to the identity of an entrant, the Promoter reserves the right, in its sole discretion, to determine the identity of the entrant and exclude from the competition if deemed appropriate. Errors and omissions may be accepted at the Promoter’s discretion. Failure by the Promoter to enforce any of its rights at any stage does not constitute a waiver of those rights. 4. It is a condition of entry that only one entry per day, per person will be accepted. 5. The promoter accepts no responsibility accepted for late, lost or misdirected entries. 6. Promotion commences Monday 9th December at 12.00PM AEST and finishes Friday 20th December at 11.59PM AEST (the Promotion Period). The promotion is over a twelve (12) day period. 7. The judging will be conducted following each day of the competition between 9am-5pm AEST at Get Glossy Pty Ltd at 147 High Street, Preston VIC 3072. The winners will be announced on the Always Fresh Facebook page on the following day of each giveaway between 9am-5pm AEST. Winners will also be notified via email within 24 hours. Prizes must be claimed within 3 months. Judges’ decision is final and no correspondence will be entered into. 9. The best and most creative/entertaining entries, as judged by the Promoter, will win. As a game of skill, entries will be judged solely on creative merit. Any entry not including a creative response to that week’s question statement shall be deemed invalid. DAY 1: There will be three (3) winners. Each winner will received 1 x Bunnings voucher valued at AUD $50 RRP. DAY 2: There will be five (5) winners. Each winner will received 1 x Christmas ornament prize pack from Red Punch Buggy valued at AUD $7.50 RRP. DAY 3: There will be five (5) winners. Each winner will received 1 x French inspired print from The Love Shop valued at AUD $20.20 RRP. DAY 4: There will be ten (10) winners. Each winner will received 1 x Lovebird Candle valued at AUD $29.00 RRP. DAY 5: There will be three (3) winners. Each winner will received 1 x Rings from Love Hate Australia valued at AUD $65.00 RRP. DAY 6: There will be three (3) winners. Each winner will received 1 x Maker & Merchant Cushion valued at AUD $75.00 RRP. DAY 7: There will be three (3) winners. Each winner will received 1 x Woolworths voucher valued at AUD $50 RRP. DAY 8: There will be five (5) winners. Each winner will received 1 x Milk Bottle Set from Rustic in a Frame valued at AUD $22.00 RRP. DAY 9: There will be three (3) winners. Each winner will received 1 x MYER voucher valued at AUD $100.00 RRP. DAY 10: There will be three (3) winners. Each winner will received 1 x iTunes voucher valued at AUD $50.00 RRP. DAY 11: There will be five (5) winners. Each winner will received 1 x Salt&Pepper Cake Decorating Kit valued at AUD $96.70 RRP. DAY 12: There will be three (3) winners. Each winner will received 1 x AiAiAi Headphones from Hunting for George valued at AUD $150.00 RRP. 11. Total prize pool value is AUD $2,762.55 RRP. Promoter accepts no responsibility for any variation in the prize value. Prizes or any unused portion of a prize are not transferable or exchangeable and cannot be taken as cash. 12. In the event that a prize, or an element of a prize, is/are not available, the Promoter reserves the right to substitute prize(s) in its discretion to the same and equal recommended retail value and/or specification subject to any written directions from the various lottery Departments. 13. If for any reason this competition is not capable of running as planned (including but not limited to) infection by computer virus, bugs, tampering, unauthorised intervention, fraud, technical failures or any other causes beyond the control of the Promoter which corrupts or affect the administration security, fairness, integrity or proper conduct of this competition, the Promoter reserves the right in its sole discretion cancel, terminate, defer, suspend or modify the competition, subject to any written directions given by the various Lottery Departments. 14. The Promoter is not responsible for any problems or technical malfunction of any telephone network or lines, computer online systems, servers, or providers, computer equipment, software, technical problems or traffic congestion on the Internet or at any web site, or any combination thereof, (including but not limited to) any injury or damage to participants or any other person’s computer related to or resulting from participation in or down-loading any materials in this competition. 15. Any costs associated with accessing the Always Fresh Facebook page is the entrant’s responsibility and is dependent on the Internet service provider used. 16. The Promoter shall not be liable for any loss or damage whatsoever which is suffered (including but not limited to indirect or consequential loss) or for personal injury which is suffered or sustained, as a result of participating in this promotion or accepting any of the prizes, except for any liability which cannot be excluded by law. 17. In the event of war, terrorism, state of emergency or disaster the Promoter reserves the right to cancel, terminate, modify or suspend the promotion. 18. The Promoter shall not be liable for any prizes/merchandise that has been lost, stolen, forged, damaged or tampered with in any way. 19. All entries are deemed to be received at the time of receipt into the promotional database and not at the time of transmission by the entrant. 20. The Promoter collects entrants’ personal information in order to conduct the promotion. If the information requested is not provided, the entrant may not participate in the promotion. By entering the promotion, unless otherwise advised, each entrant also agrees that the Promoter may use this information, in any media for future promotional, marketing and publicity purposes without any further reference, payment or other compensation to the entrant, including sending the entrant electronic messages. Entrants’ personal information may be disclosed to State and Territory lottery departments and winners’ names published as required under the relevant lottery legislation. A request to access, update or correct any information should be directed to the Promoter at their address set out below. 21. Entrants consent to the Promoter using the entrant’s name, likeness, image and/or voice in the event they are a winner (incl. photograph, film and/or recording of the same) in any media for an unlimited period of time without remuneration for the purpose of promoting this competition (including any outcome), and promoting any products manufactured, distributed and/or supplied by the Promoter. 22. The Promoter reserves the right to request winners to provide proof of age, identity and residency at the nominated prize delivery address. Identification considered suitable for verification is at the discretion of the Promoter. 23. The Promoter is Riviana Foods Pty Ltd, of 8 Lakeview Drive, Scoresby, Victoria, Australia 3179. ABN 9 7061 388 092. 24. This promotion is in no way sponsored, endorsed or administered by, or associated with, Facebook. Entrants understand that they are providing their information to the Promoter and not to Facebook. Any questions, comments or complaints regarding the promotion must be directed to Riviana Foods Pty Ltd of 8 Lakeview Drive, Scoresby, Victoria, Australia 3179, A.C.N 061 388 092, not to Facebook. The information you provide will only be used in the ways outlined in these Terms and Conditions.